If you’re setting up a 3D projector or a projector in a brighter environment, you might want to consider the new Screen Innovations (SI) Black Diamond G3 screen series. The Black Diamond G3 allows viewers to enjoy projection in bright environments anywhere, anytime. All-new 2.7 gain for commercial and 3D applications. 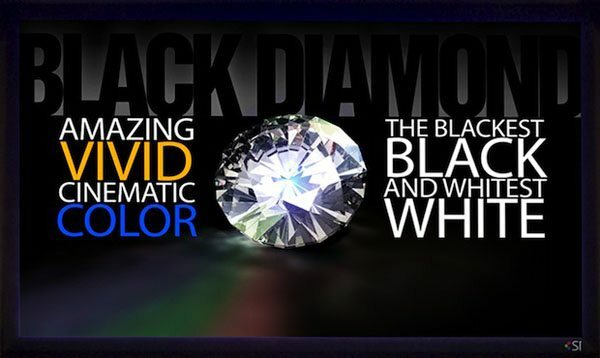 Black Diamond 2.7 is polarization preserving for passive 3D and increases projector brightness by 2.7 times compared to a 1.0 gain screen. Black Diamond is counter intuitive when it comes to viewing angle. The new high gain 2.7 Black Diamond has one of the widest viewing cones available making it the perfect solution for wide audience viewing. All-new .8 and 1.4 gain materials are much darker with improved light rejection, increased contrast, and razor sharp smooth images.